Tomato Patch: Is it "mealy, mushy" time? The thermometer got me to thinking this morning. It was 43.7°F just before sunrise, the lowest temperature in the Tomato Patch since I set out the plants in May. That was my concern this morning I read the outdoor temperature on our digital thermometer. Will my “big reds” turn mealy at that temperature? I vaguely remembered a Washington Post article I had read on the subject years ago, and after some searching on the Internet I found it. The important factors: temperature + duration + ripeness. Temperature factor is any temperature below 50°. For duration, long-term chilling is worse than short-term. On ripeness, Wolke explains that chilling tomatoes not fully ripe stops the ripening process and prevents development of full flavor and color. How do I apply Wolke’s refrigerator principles to what’s happening in the Tomato Patch? Nighttime temperatures are starting to dip below 50°. 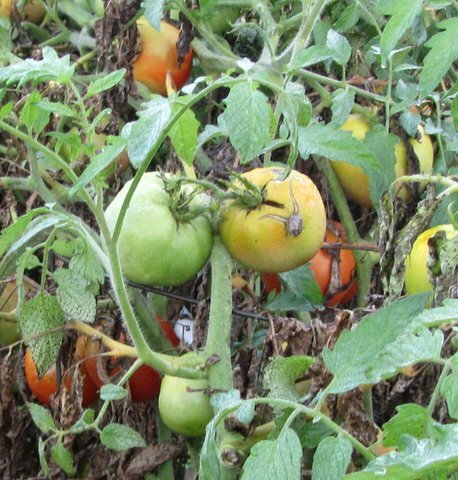 A few dips probably won’t do much damage to taste or texture, especially to fully ripe fruit, but as the weeks pass and low temperatures increase in length, damage potential increases, especially on tomatoes not fully ripe—the kind still growing in the Tomato Patch. I plan to keep an eye on my tomatoes—the ones the stink bugs didn’t pinprick beyond edibility or the rains of Hurricane Irene and Tropical Storm Lee didn’t split—and at some point start picking and moving the best looking ones into the garage as protection both from late-season stink bugs and frigid nighttime temperatures. I don’t plan to start moving them this week. I’ll monitor local weather forecasts and the condition of remaining tomatoes. If we have especially cold nights in late September or early October, perhaps I’ll some top-quality breaker-stage tomatoes into the garage. If the nights stay relatively warm, perhaps I’ll move none. Alas, fall is coming. A killing frost will visit many of our gardens within the next month or so. The end of Tomato Patch 2011 is a sad thought, but then in a few weeks the seed catalogs will begin arriving to jump start our fantasies about Tomato Patch 2012. If you’re a genuine tomato freak and wish to read Wolke’s Post column, CLICK HERE.